For leaders of customer service teams, The Managing Customer Service Pocketbook draws on some startling statistics to highlight the benefit of building customer loyalty. For example, one study shows that a mere 5% increase in customer loyalty can boost profitability by up to 85%. Earning loyalty is about delighting the customer by delivering outstanding service. 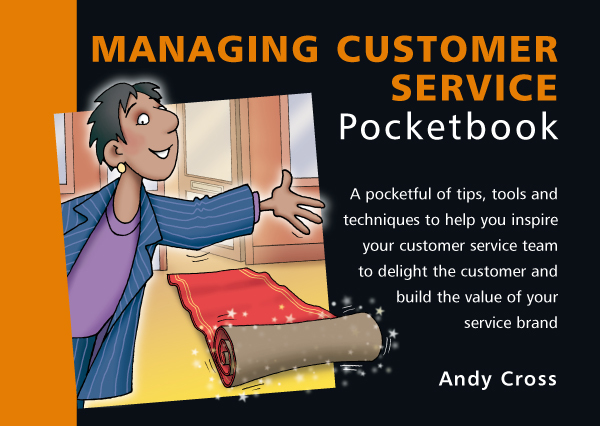 And, as the book’s author Andy Cross explains, the bedrock of service excellence is the ‘service brand’. The book uses a 5-stage model to describe how to create and nurture such a service brand through the recruitment, training, leadership and motivation of a customer service team that works diligently and passionately for the highest possible standards of service. Stage one is to establish the vision or the brand values by properly understanding what it is that the customer wants above all else. This is what drives the team. Then you have to align these values with those of the team itself. This is achieved through careful recruitment, training and inspirational people management. Further stages in the process of managing the service brand cover: coaching the team to deliver consistently brilliant service; what to do when things go wrong (top tips! ); and how to create an environment in which team members have the freedom to improve. We believe you’ll be ‘highly satisfied’ with this book and, if statistics are to be believed, ‘six times more likely to order again’!